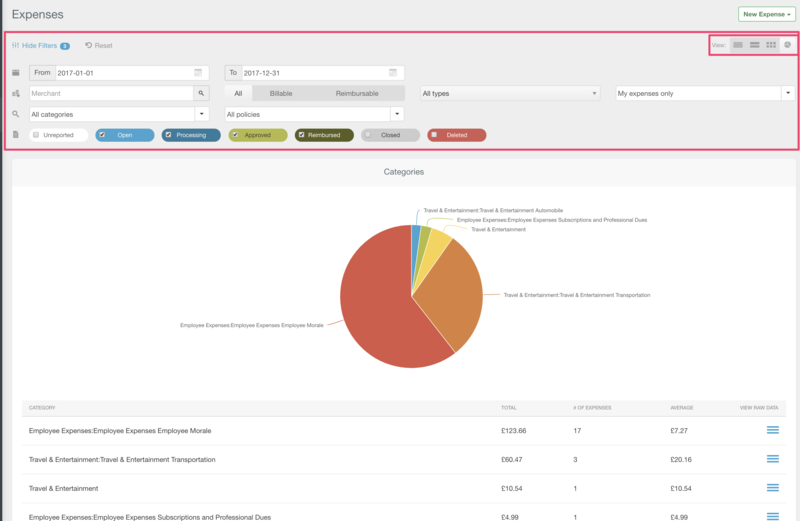 What and where are Expense Analytics? Filters - these allow you to filter by Date Range, Merchant names, Policy, Categories, Tags, Billable/Reimbursable flags, Submitters, Expense status' and Types. 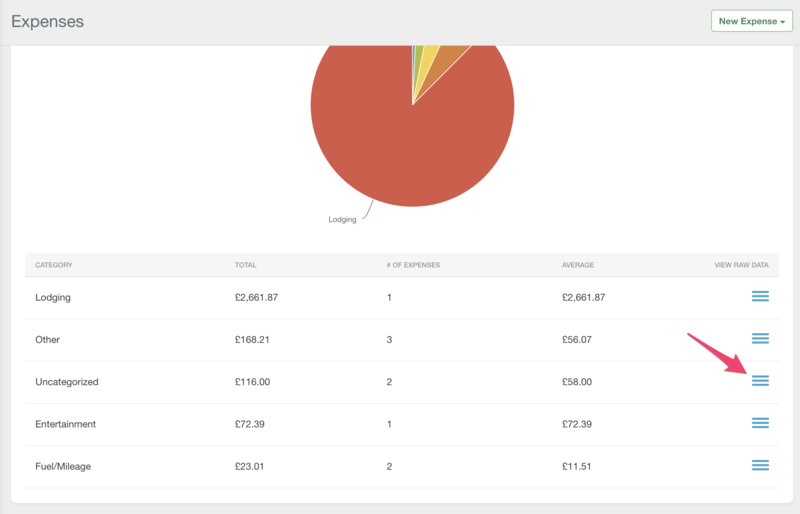 Analytics View - coupled with the powerful filters, you can easily visualise the filtered total spend by Categories, Tags and Cards. Custom CSV Exports - if you can't extract the insight you need within Expensify, you can always bulk export your data to analyse, LOOKUP and pivot as much as you like! This article will cover using both 1. and 2. to get the best out of the in-product analytics. If you still need to dive deeper into a spreadsheet, check out 3. Custom CSV Exports. There is no requirement to own a paid policy in order to access Expense Page analytics. The view is available to every Expensify user. That is to say - the amount of data you're able to view is entirely dependent upon your role(s) within any policies you're a part of. *You may notice that not all of the Expense filters show at all times. These are shown dynamically based on the data set you're currently filtering. Eg: If there are no Deleted expenses to filter out, the filter won't show. Great! I know we don't Tag our non-reimbursable company card expenses, so this particular breakdown shows nothing specific for the Card or Tag analytics. To pull up the list of just expenses for a single line, hit the Hamburger-three-line-icon in the View Raw Data column. Finally, there's no need to switch back to the other Expenses page views to change the filters shown displaying data in the Pie-Chart view. Any amendments will be updated immediately in the graphs and tables shown. Expenses page analytics can only break down so much. They're a great tool for a quick overview - but if you want to Export your data to a spreadsheet, you can export everything from a list of just Merchant's and Submitters to a file full of Tax Amounts, Report Fields and GL Codes with Custom Formula's and a Custom CSV Export! If you're looking for more in-depth tools for accountancy analytics, Expensify Integrates with multiple Cloud and Desktop accounting software providers to seamlessly integrate your Expense data with the rest of your books. A specific transaction isn't showing up no matter what I've tried. How can I find this transaction? If the expense was incurred on a Company Card assigned in Settings > Domain Control > [Domain Name] > Company Cards, try the Reconciliation Dashboard filters. If you SmartScanned the receipt via receipts@expensify.com, try filtering to the date you forwarded the email. Is the expense you're looking for on an Open report for one of your employee's? If you're not a Policy Admin, you won't be able to view or edit those expenses until the expense has been submitted by the user in question. Any more graphs or analytics? Not at the moment, but we're always open to ideas. For the time being, only pie-charts and the analytics outlined above are available within the product on the web, but you can make as many as you like in your spreadsheet tool of choice with a Custom Export. If you'd like some more, head on over to our Community Idea's section. Be sure to explain your use case for others to vote on!